TA DA! My 20th pair of socks this year. 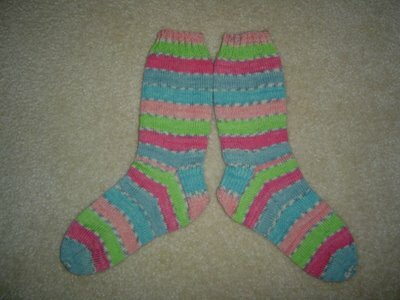 These are the Spey Valley Socks from Knitting on the Road by Nancy Bush. I resized them to fit Mickael's big, manly feet. They are knit on US 1.5's from Shelridge Farms Soft Touch Ultra in Charcoal. I used 3 skeins. I'm happy with the way they turned out and he seems happy to have them. (He's well trained and knows to act thrilled, whatever I knit him.) I want to knit these socks again in a lighter colored yarn for myself, just so I can see the pattern on the leg better. The design of the sock is pretty, but I just can't get a good picture of the stitch pattern section - the yarn is too dark. Thanks for all the complements on the puppy. We're all so excited around here, its ridiculous. 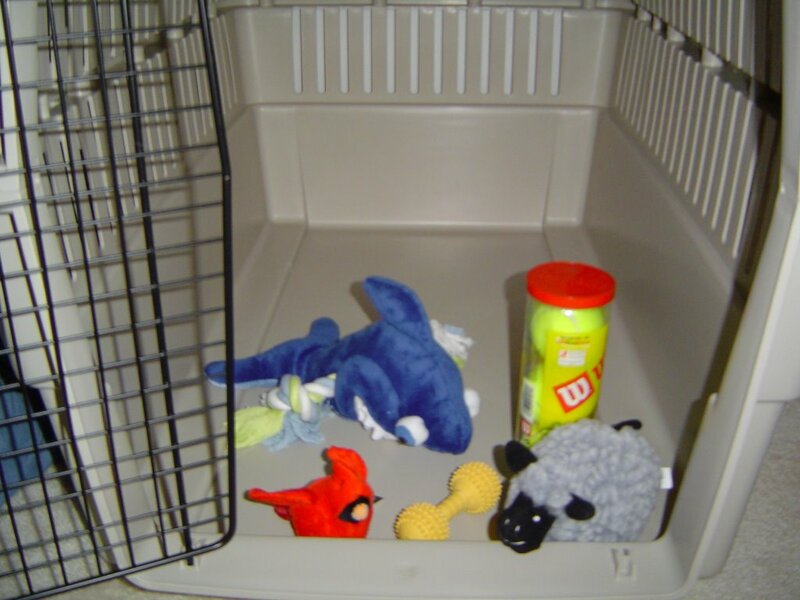 I appreciate the tips to help with crate training. 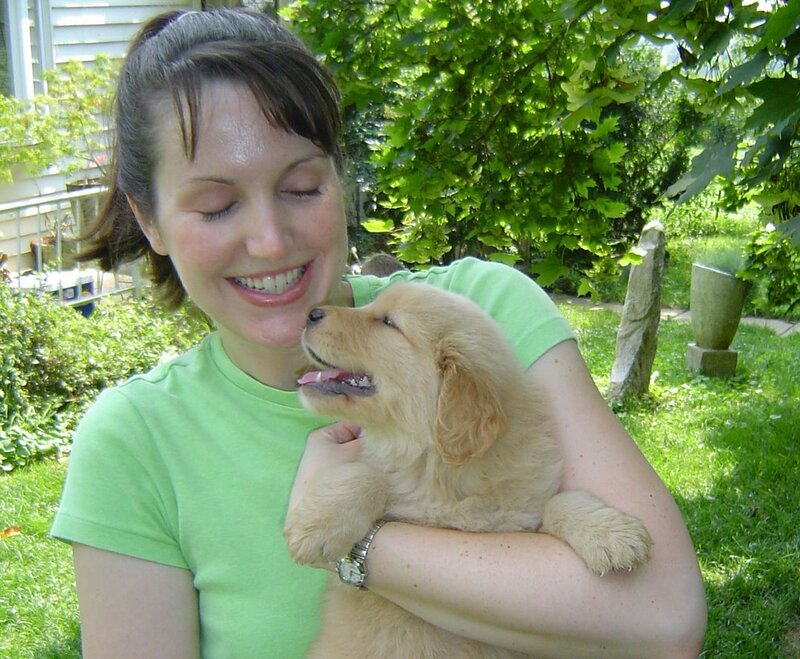 Mickael was raised with dogs and I got my first dog in Junior High, but neither of us has ever crate trained a dog. Either it wasn't being done very much, or it was only done by trainers and without the Internet, no one else knew about it. 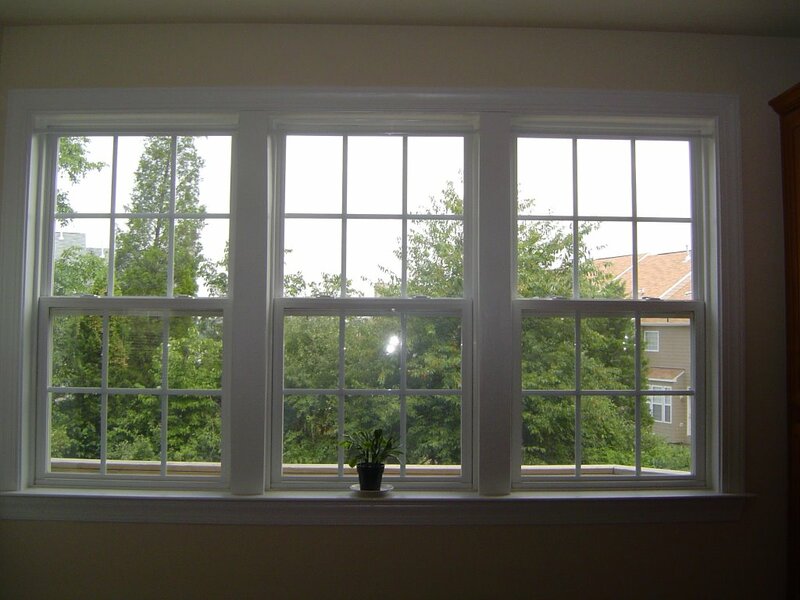 I'm excited about doing it and I think it will make the whole housebreaking experience easier on all of us. I hope everyone has a great weekend - enjoy the cooler weather California! I'll be back Tuesday. I would like to introduce you to our puppy! We went yesterday and did puppy personality tests on all of the little boys and I believe this little guy will be the best fit for our family. He scored as not too dominant, but definitely not submissive either - a nice middle of the road, laid back kind of guy. As you can see he's also just adorable. 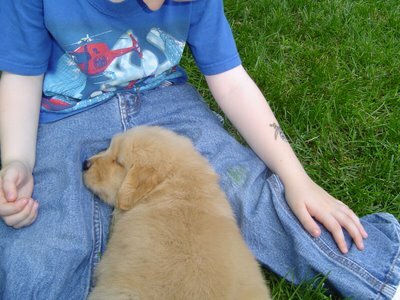 This is actually the same puppy that fell asleep on Caleb's lap last week when we went to play with the little guys. We can't bring him home for a couple more weeks - he's not quite old enough and we've got some things going on that aren't conducive to welcoming a new puppy into our family. When we do go to get him, we'll have nothing on the calendar for almost two weeks, until school starts so he should have plenty of time to settle in and get acquainted with us. Every time we go to visit puppies, Ramius is just fascinated by the wonderful smells we bring back. I'm hoping this means he's interested in meeting the puppy and not that he's wanting to eat the puppy. Tomorrow I will have knitting content again - this has kind of turned into a dog blog lately. Thanks for humoring me as I share the excitement around here with everyone! We've lived in this house for almost 3 years. 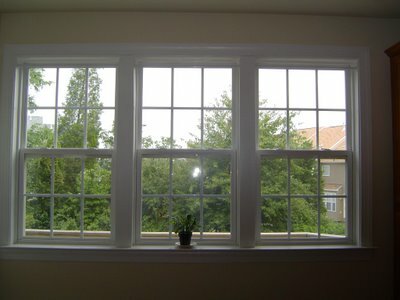 In all that time I've never done anything with the kitchen windows. 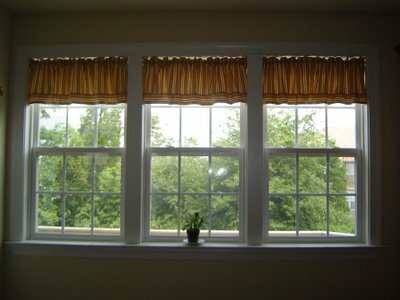 I finally decided to make some valences for them, just to give them a little color. TA DA! 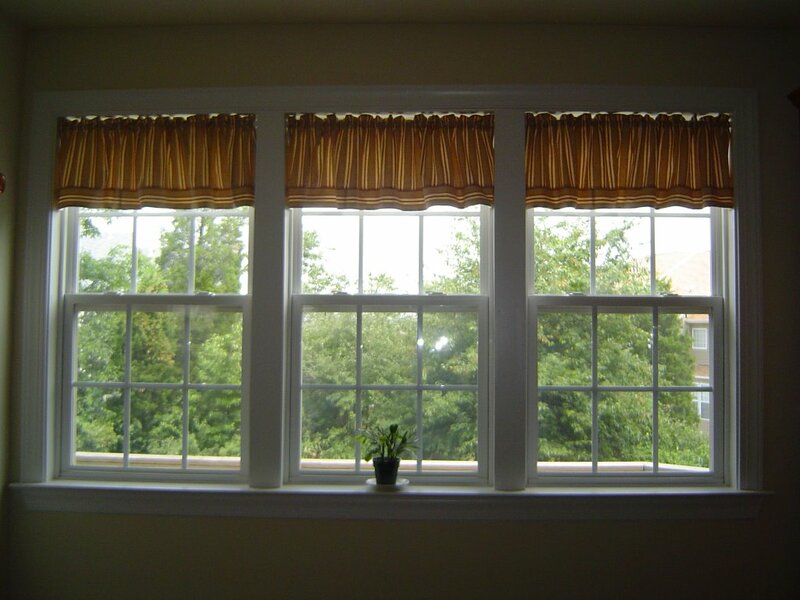 I used a striped fabric that I didn't have quite enough of to make all three valences, but I was able to trim them with more of the same fabric running perpendicular and I'm pretty happy with them. The Christmas Cactus that lives in the window doesn't seem to feel one way or the other about them, but he hasn't jumped out of the window lately so I guess that means he's OK with the change. This Christmas Cactus is one of two plants that live in our house - there's also a Jade plant. Both are low maintenance plants which is a good thing when I'm involved. Anyway, the Christmas Cactus has an unfortunate habit of jumping out of the window - or maybe he's a Kamikaze Cactus. At first I thought it was somehow cat related (very few plants are able to jump from a windowsill unassisted), but it has happened when Ramius is upstairs with me so I ruled out cat assisted plant suicide. It hasn't happened in a while so either he's preparing himself for a big, middle of the night, scare everyone in the house type of event, or he's worked through his problems and is feeling better about life in general. 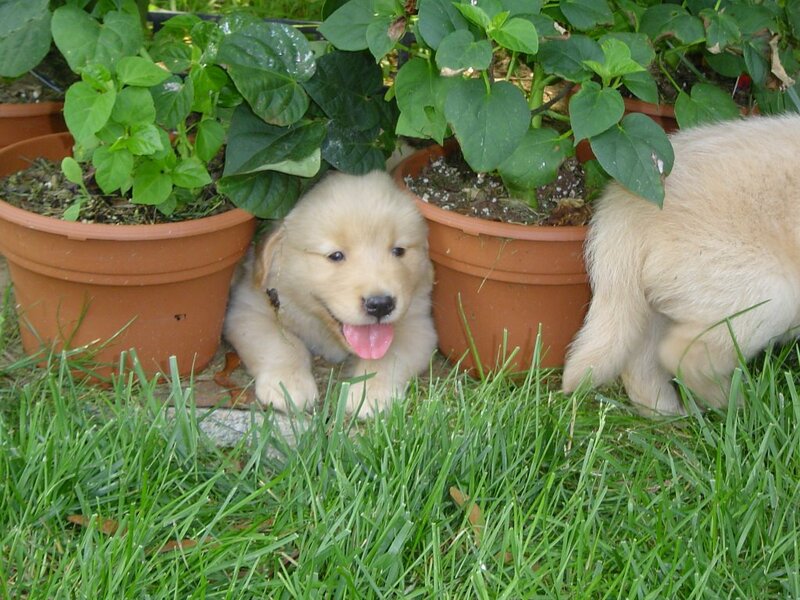 Its hard to tell with a plant. ...and it isn't socks today! I quickly found out that photographing puppies is different from photographing knitwear (and sleeping cats). For one thing, puppies like to run around. Of all the knits I've photographed, not a single one got up and ran around while I was trying to take its picture. 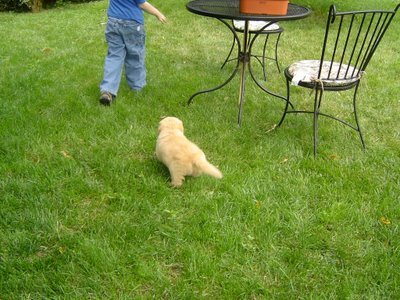 Add an older digital camera to a zippy little puppy and you get lots of pictures of puppy bottoms as they race out of the frame - and one or two great pictures of grass, without a puppy. This is the front end that's connected to the back end in the picture above - I think. 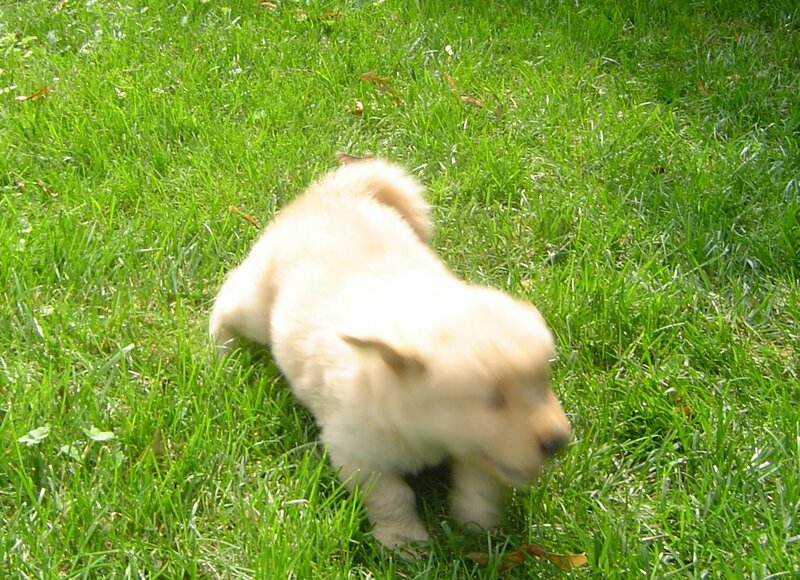 Its hard to keep up with the cute little guys! Then it was back up and time to chase the 5 year old. Caleb and the puppies had a blast playing! Its going to be really fun watching him and the dog grow up together. Finally, it was time to settle in for a little nap. Being a smart little puppy, he chose to snuggle up with his new play buddy when it was time to rest. 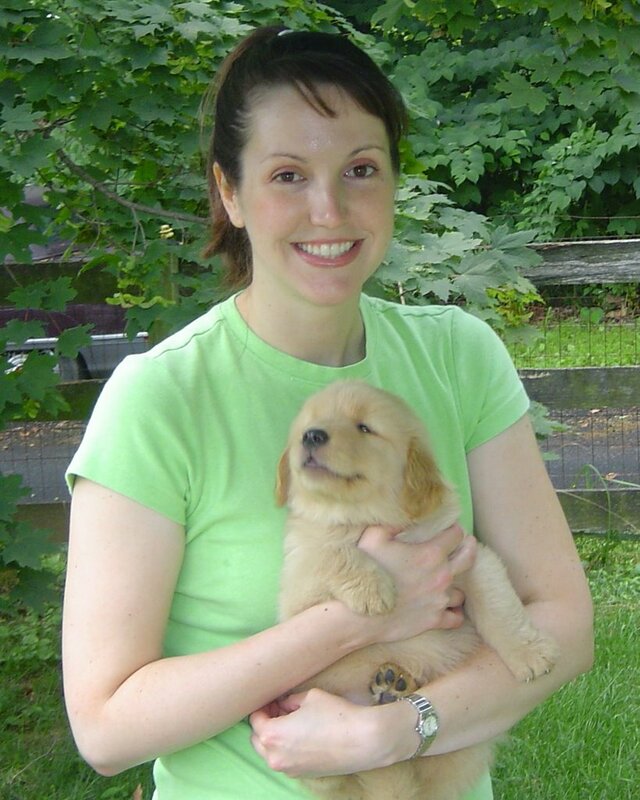 We'll be going back this week to pick out our puppy - they'll be just 6 weeks old and will have enough personality for us to be able to tell what kind of dog they have the potential to become. There are 5 males in this litter so we have plenty to choose from! I'll be sure to get pictures of our puppy once we figure out which one he is. I'm loving all the hints and suggestions you guys are leaving in the comments - its a big help! We've been doing some shopping in anticipation of the arrival of our newest family member! We can't bring the little guy home until mid August, but we can bring home things he'll need. As you can see, we have the ginormous crate (its the size recommended for Golden Retrievers and Labs - I know, it looks like we could kennel Godzilla in there). Don't worry about it right now - I picked up some things to make him a soft bed to go in there. No fluffy little puppy of mine will be sleeping on hard, cold plastic! Caleb and I also hit the dog toy aisle at Target and probably had way too much fun. Clockwise from center front: A yellow dumbell shaped rubbery tooth massager thingy - that's a technical term, a Cardinal dog toy - it has a tennis ball and a bell inside it, Sharkey - kind of a demented plushie/rope combo that hopefully won't give the puppy nightmares but totally cracks me up, a can of tennis balls - cheaper in sporting goods than in the dog section, and finally - a squeaky sheep! Of course my dog will have a squeaky sheep - how could he not? Caleb is also really involved in what's going on with the new puppy. Its really neat teaching Caleb what he'll need to know about the puppy. At 5 - 1/2 years old, he's big enough to really be involved with the puppy's care and training so I'm making an effort to teach him what he'll need to know to help the puppy make a good adjustment. He's also pretty excited about all the toys - Sharkey cracks him up too. 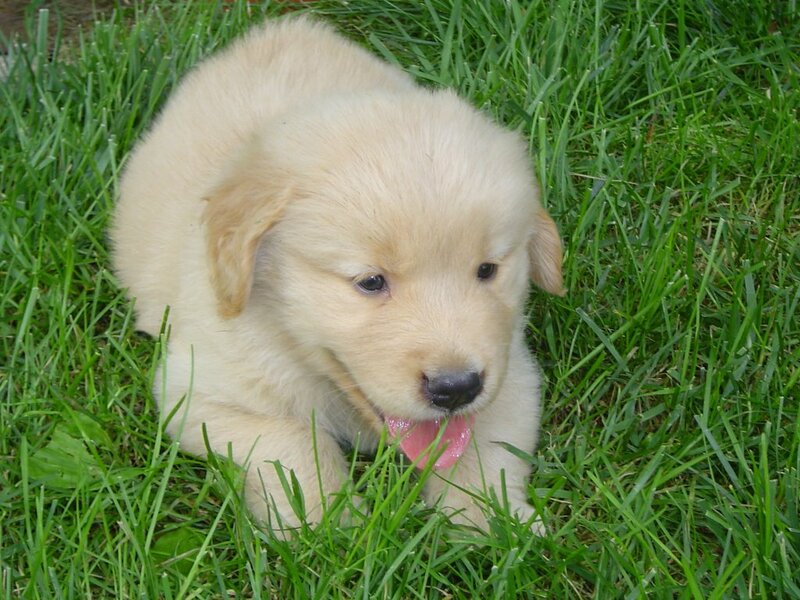 We hope to be going to the breeder's later today to see the puppies again - if it doesn't rain. I do have my camera out and with my purse, so it has a pretty good chance of getting in the car with us this time. Hopefully Monday I'll have some canine eye candy for the blog! Have a great weekend. No pictures today. I've gotten a lot done on the Mystery Stole but I can't show everyone that project for a few more weeks. I got a little bit more spun on my silk caps, but the difference isn't noticeable on the spindle. And also in the I-Worked-On-It-But-No-One-Can-Tell department, I got out Soleil last night and got a bit more done on it. So, no pictures. Its been too hot and humid to spend any time outside this week, but I think its supposed to cool off later this week. I find myself looking more and more at Fall sweaters and coming up with ideas for designs - I can't wait to finish up the Mystery Stole so I can work on some of these ideas! I'm going to skip blogging tomorrow and see if I can't get the first half finished on the Mystery Stole and get started on the second half. See you Friday! I've been working on the second sock for Mickael. 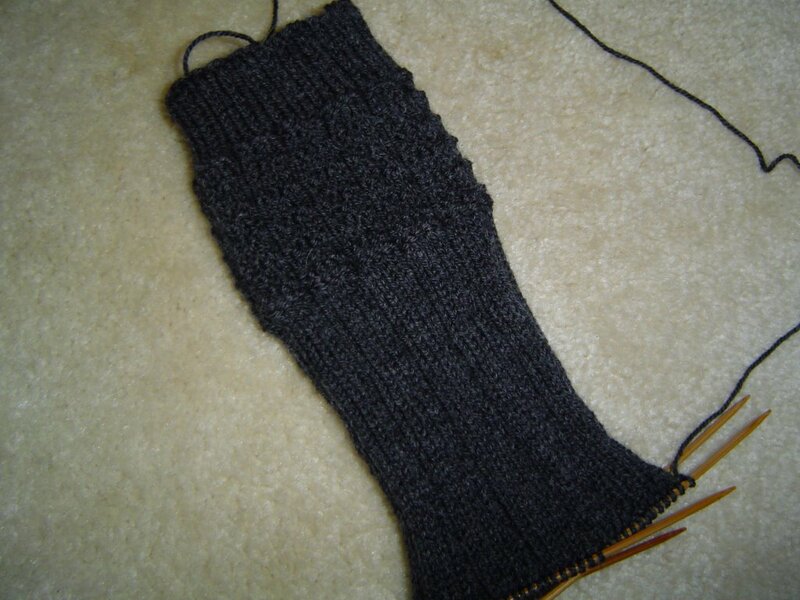 I finished up the leg last night and its ready to have a heel. Vanessa commented on the leg shaping last time I babbled about these socks and guess what Vanessa? There is no leg shaping! The stitch count stays the same all the way down the leg of the sock. I think the thing that is making the top part of the sock look larger is the Vikkel Braid that Nancy Bush used to frame the knit and purl section of the sock. (These are the Spey Valley socks from Nancy Bush's Knitting on the Road book.) It doesn't show up really well in the photo - and to be perfectly honest, it doesn't show up really well in the actual sock, but there is a row of stitches at the top and bottom of the wide section that actually go around the sock horizontally. The really cool part is that they are worked as I knit down the sock - there's no real change of direction as I'm knitting, there's just this special twisted stitch thing from Estonia. 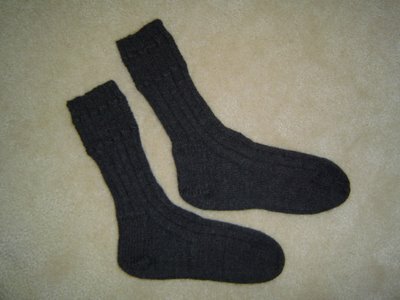 I will have to knit myself a pair of these socks, but I'll use a different yarn so maybe the Vikkel Braid will show up! I started playing with some silk caps this weekend. I got some from The Silkworker around Christmas time (she doesn't normally carry them), but hadn't done more than Oooh and Ahhh over them. There's a really great article on how to spin silk hankies from Knitty a while back that was like a lightbulb for me for spinning these. I knew people did it, and I loved how hankies and caps (they are essentially the same thing, just different shapes) looked, but I didn't know how to spin them or even prepare them for spinning until I read the article. Doing the predrafting for the caps is great TV time and then spinning goes really fast. The colors aren't showing up really well in the photo, but these caps are blue, teal, and a cinnamon brown with a tiny bit of pinky purples. The yarn you get with silk caps is more textured than what you'd get with silk top but I think it will be really interesting once its finished. Lookie what I got! (Please ignore the really bad picture, and the glare in the really bad picture.) 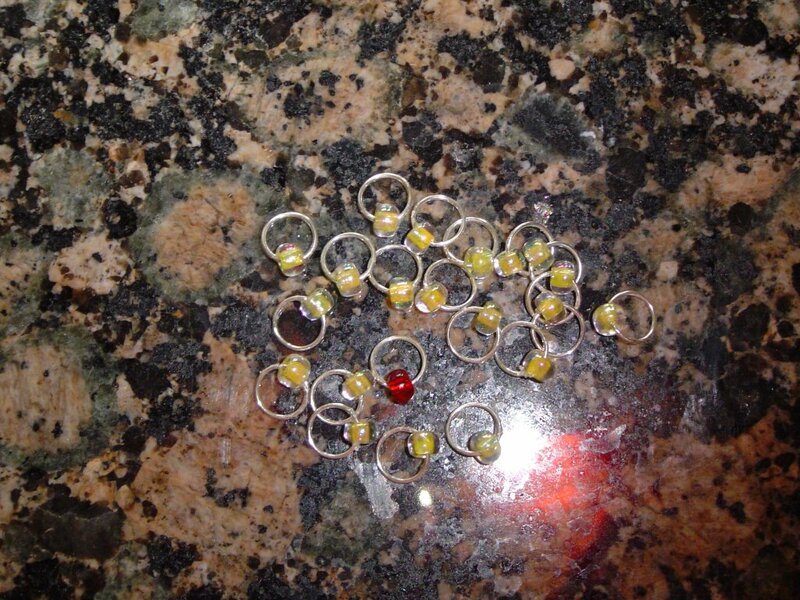 Susan from The Elegant Knitter sent me these pretty stitch markers as a Thank You for doing Mystery Stole 2! 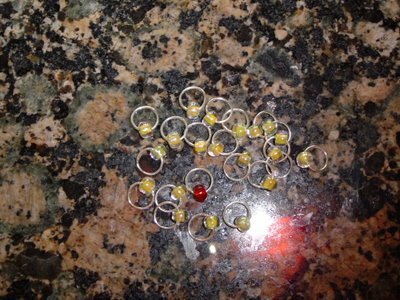 There are 21 stitch markers, 20 are a pale, creamy color, and one is red. They are on loops of sterling and are perfectly sized for lace knitting (or possibly some really fancy socks.) The great thing is that I plan on knitting a shawl after I finish knitting the Mystery Stole and all of the patterns I'm considering will require stitch markers! Isn't it great when someone reads your mind and sends you just what you need? Thanks so much Susan! Ramius would like to thank everyone for all the complements. He also wants everyone to know that he loves big dogs, and while he's never met a puppy, he's pretty sure he won't have any trouble from the little guy. Ever since we first got Ramius (he weighed a whopping 2 pounds as a tiny kitten) he's been playing with big dogs. 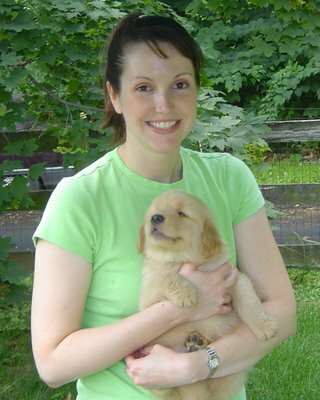 He played with Bear, our Golden as well as my In Law's Golden, Casey, and their Black Lab, Ben (total dog weight - 240 pounds) all at once and thought it was wonderful. Last summer he met my In Law's new Golden, Zach, who was full size, and Ramius just walked right up to him, purring the whole time and rubbed against Zach. Zach fell in love with Ramius too. I'm sure he'll be pretty happy to have a sidekick again. I've also started the second half of the merino/hemp top and I got a lot done on the Mystery Stole, but I can't show you that! Have a great weekend and I promise I'll find something interesting that I can show you! Yep, I had to wake up His Highness to have something to show for the blog. Not too much got done yesterday. 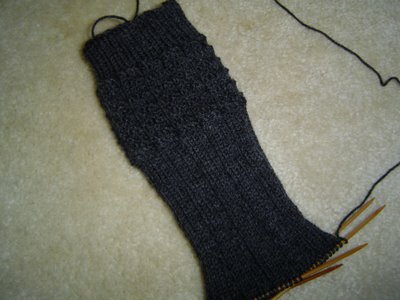 I cast on and started Mickael's second sock, but that's not very exciting. 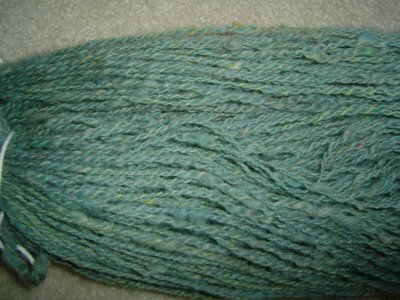 I spun some more of the Merino/Hemp, but it looks the same as it did the other day. So, what did I do yesterday? We went and looked at puppies! We used to have a Golden Retreiver, Bear, but we had to put him to sleep last year. 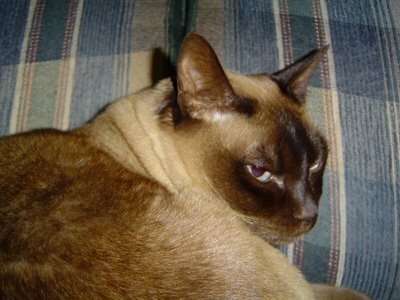 He was 14 1/2 years old and I met him when he was 10 weeks old. (Mickael got him for Christmas one year and we started dating soon after that.) We are finally to the point where we're ready for another dog in our lives so I've been calling around and talking to breeders. The puppies are only about 4 weeks old now, so we haven't even picked out a specific one (we'll wait a couple of weeks to see how their personalities develop), but we'll be going to visit them and watch them grow. I walked out yesterday without the camera, but hopefully I'll get some pictures next week. Naturally, we're all very excited - especially Ramius because then I can blog the dog and let him sleep! All that's lacking on this first sock are the toe decreases! I've decided that the hardest part of knitting for someone else is that their feet aren't really where you need them. Mickael keeps taking his feet to work where I can't try the sock on them. On my own socks, I try them on periodically to check fit, find out how much more I have to knit before I start toe decreases, marvel at the stitch pattern, ooh and ahh over how the colors of the yarn are lining up into such a lovely pattern, and other important sock activities. These socks are a different story. In a best case scenario, his feet are at home, but I still have to convince him to sit down, take off his other socks, and try on the sock in progress - but be careful and don't break the needles! As anyone who's ever tried to get a man to do anything knows, this process can take a while. Of course once his feet go to work with him, I can't try anything on him. I do seem to be getting less and less resistance from him as the sock gets bigger so either he likes the sock, or I'm just wearing him down. Either way, he's just lucky its a solid colored sock - patterned yarns must be tried on 5 times a day just to see what the yarn is doing! Tour de Fleece - still treadling! So far I'm still on track with Tour De Fleece. 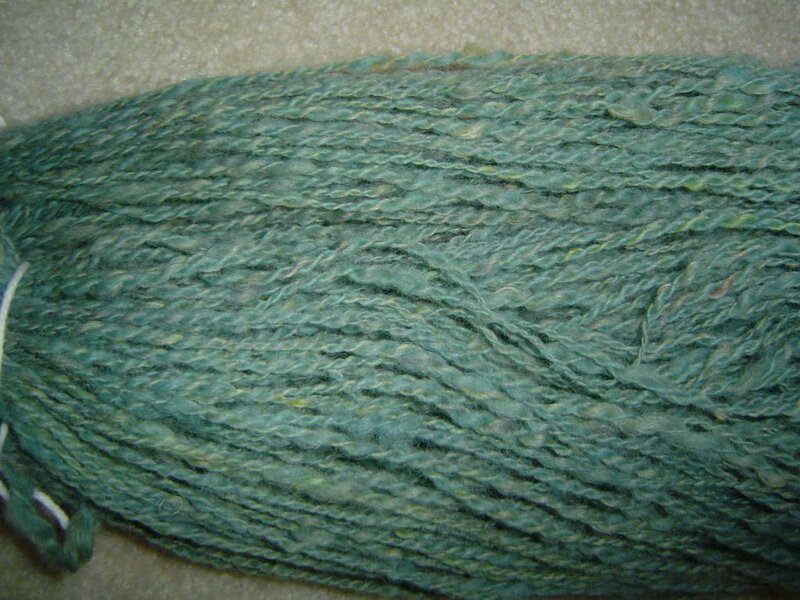 This is a Merino/Hemp blend that I got from D'Zined at Maryland this year. I love the way the singles feel and I can't wait to feel the finished yarn. The Merino makes it soft and the Hemp gives it a really nice drape. 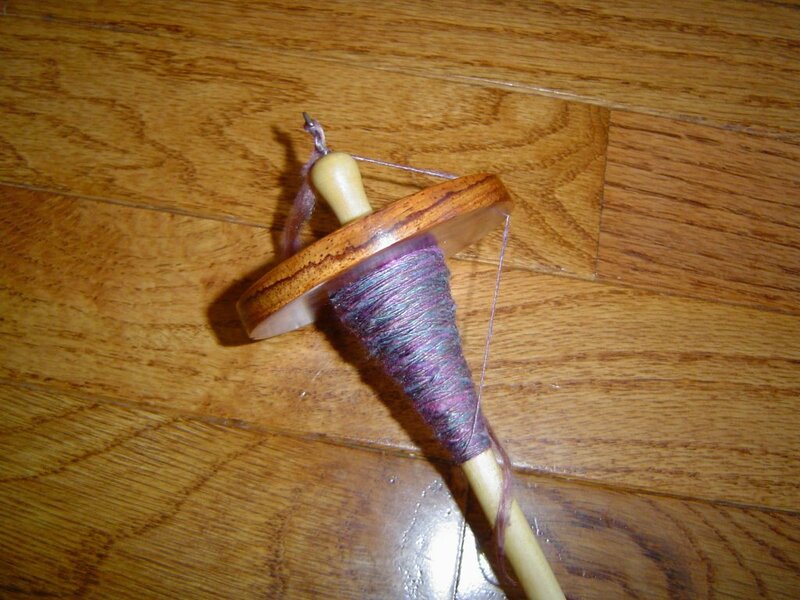 I'm not sure what I'll do with the finished yarn yet, but spinning it is really fun. 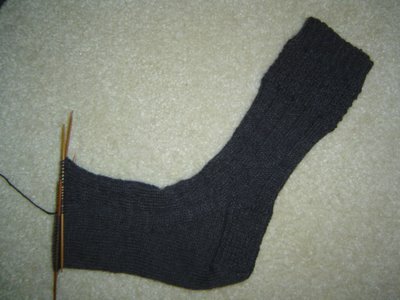 I also got past the gusset on Mickael's first sock so all I have to do is the foot on that. That's all the knitting I got done this weekend though. Why? Well the first clue went up for the Mystery Stole 2006 and, like last year, once a clue goes up the group gets more chatty. Unlike last year, this year's group isn't slowing down on the postings once they get to knitting. Either its the increased size of the group (we're at 900+ now and last year topped out at 700+), or people in this year's group have learned to type with their toes so they can knit and chat at the same time. Don't get me wrong, its a great group - everyone is helpful, kind, and its a really fun and easy group to moderate, I just wish someone would teach me how to type with my toes too! My first finished skein from Tour De Fleece! Here is my first finished skein from my Tour de Fleece spinning. This is the wool and mohair from a mystery vendor at Maryland. I've also plied the blue and green singles together, but they are having a warm bath in the washing machine right now and can't come to the blog. I've also been working on knitting up the Mystery Stole to check chart accuracy - I'm on the fourth part which puts me 3 weeks ahead of the group, but I'm still working on it. If you are a part of that knitalong, go download the first clue - its available! I hope everyone has a great weekend. Sunday was our wedding anniversary. Mickael and I have now been married 13 years! In all that time, I have never knit the man socks. That's all about to change. These are the Spey Valley socks from Nancy Bush's Knitting on the Road. I had to make some adjustments to the sizing but these should fit (I made him try them on, on the needles, after I'd knit the first 2 inches, just to make sure they were big enough). I figure these socks give me something interesting at the tops of the socks, but that part will be under his pants legs and the only thing that might show is ribbing. 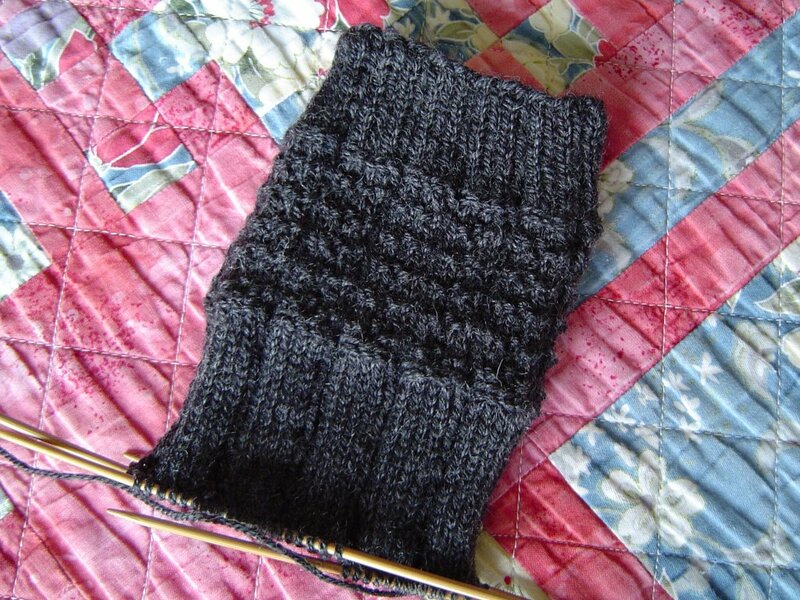 I'm using Shelridge Farm's Soft Touch Ultra in Charcoal on size US 1.5 needles (2.5 mm). Caleb also keeps asking for some more socks, but I'm waiting until closer to the end of Summer before I knit anything for him - I figure he might grow some more between now and lunchtime and if I knit socks for him now, the cat might be the only one in the house who can wear them by the time Fall rolls around. 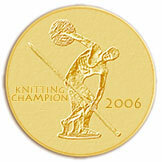 Tomorrow, the first clue is posted for the Mystery Stole 2006, if you haven't joined yet, click here now! I finished the pair of socks that so graciously modeled for my Generic Sock pattern. These are made of Trekking XXL in color 134. US Size 1 needles were used. I'm pretty impressed at how perfectly these socks worked out. I measured where I was in the repeat when I began my first cast on and tried to match it up for the second sock's cast on - I think I did a pretty good job if it. This is the first time I've ever tried to match up self striping yarn (I don't use it much) and I'm glad to know it works. I hope that everyone who celebrates the 4th of July has a great one! Those of you in other countries, have a great day too! This is the third day of Tour de Fleece and so far I'm doing great! What you can see is my spinning from the first two days. Its a wool/mohair blend (probably Romney or something similar) that I bought from an unknown vendor at Maryland and plan to make socks from. 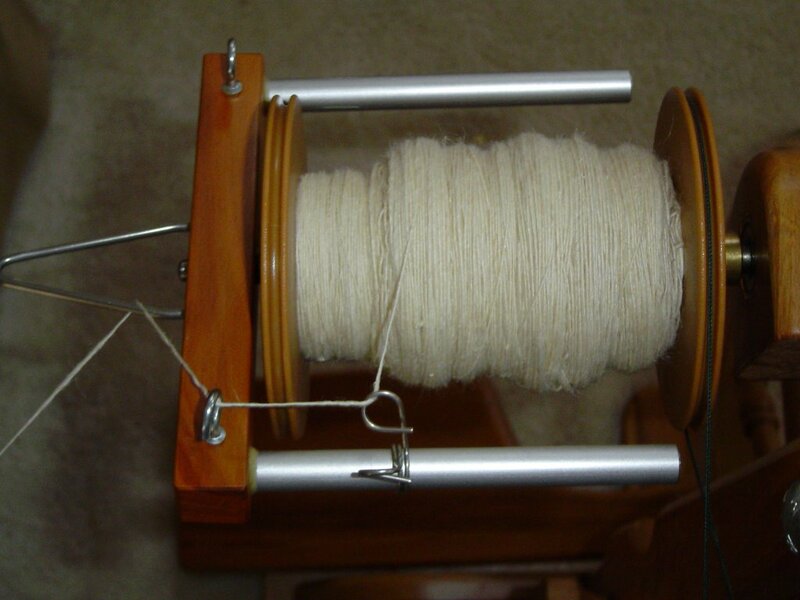 I've finished one bobbin and hope to finish the second bobbin for today's spinning. I'll ply these pretty soon since I've spun them up so quickly. 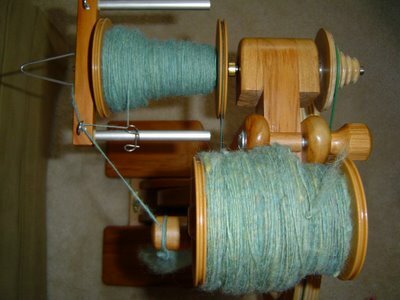 I'm waiting a few more days before plying the blue and green singles I showed Friday because the green singles (which I spun first) sat on the bobbin so long the twist should have settled, while the more freshly spun blue singles still had an active twist. I've found that if I ply when the twist is either active on both bobbins or set on both bobbins I get a nicer, more balanced, finished yarn. Mixing active twist and set twist doesn't work as well for me. At sometime over the next few days I need to do some cleaning on the blog and get some buttons up. I also plan to link to the sock tutorial in the side bar - that should make it easier to find if anyone needs to come back to it at some point.